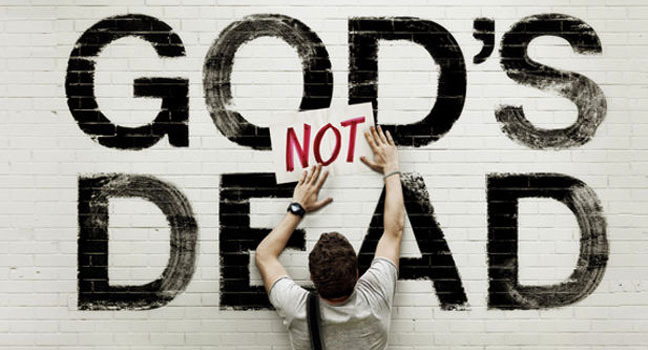 Entering theaters Friday, March 21, God’s Not Dead got off to a respectable start for a film of its genre, earning $9 million during the opening weekend. The movie stars Kevin Sorbo as philosophy teacher Jeffrey Radisson, and Shane Harper as one of his students, Josh Wheaton. As a part of a lesson, Professor Radisson asks his class to bypass the debate on God’s existence and instead write “God Is Dead” on a piece of paper. Wheaton refuses and, as a result, has to defend the notion that God is indeed not dead. He is given three twenty-minute sessions of class to defend the position, and whether or not he fails the assignment depends on whether he can convince the class to recant their statement that God is dead. In the process of deciding whether or not to accept the challenge, he receives criticism from his family, his girlfriend and his friends but ultimately decides to take it on, even with Professor Radisson fighting him every step of the way. Eventually, Radisson turns the classroom into a debate hall starring himself to finally come up with an answer to the question. While God’s Not Dead does a great job highlighting arguments of the faith, it tries to do too much with other story arcs; these side stories take away from the main focus of the film. The movie itself is highly predictable, more so than films tend to be already, and while the acting was stellar, bringing multiple story lines into the plot impeded the potential of fully developing the films main characters, thus greatly hindering the final product.